Aihole is a memorable site of old and medieval time Buddhist, Hindu and Jain landmarks in north Karnataka (India) dated from the fourth century through the twelfth century CE.Located around an eponymous little town encompassed by farmlands and sandstone slopes, Aihole is a noteworthy archeological site including more than one hundred and twenty stone and give in sanctuaries from this period, spread along the Malaprabha waterway valley, in Bagalakote locale. Aihole is 22 miles (35 km) from Badami and around 6 miles (9.7 km) from Pattadakal, the two of which are real focuses of verifiably critical Chalukya landmarks. 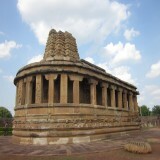 Aihole, alongside close-by Badami (Vatapi), developed by the sixth century as the support of experimentation with sanctuary design, stone work of art, and development strategies. This brought about 16 sorts of unsupported sanctuaries and 4 kinds of shake cut shrines.The experimentation in design and expressions that started in Aihole yielded the gathering of landmarks at Pattadakal, an UNESCO world legacy site.